● ● ● ● ● ● ● ● ● ● ● ● ● JULY 2018 • FOODSERVICE EQUIPMENT & SUPPLIES • 73 Food on Demand (FöD). Sodexo prepares the menu and communication for the tools and screens shown on the kiosks where customers order. A third- party vendor handles the ordering technology. 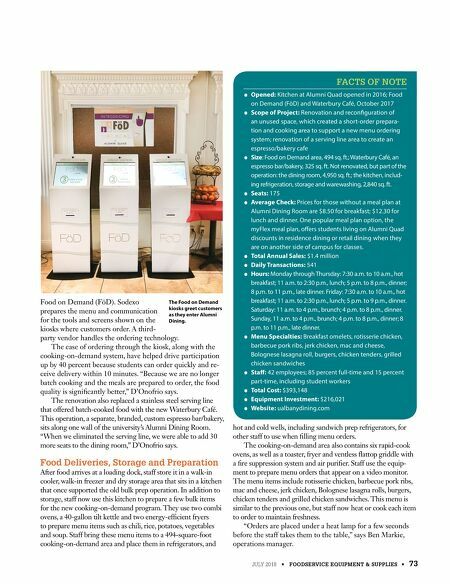 The ease of ordering through the kiosk, along with the cooking-on-demand system, have helped drive participation up by 40 percent because students can order quickly and re- ceive delivery within 10 minutes. "Because we are no longer batch cooking and the meals are prepared to order, the food quality is significantly better," D'Onofrio says. The renovation also replaced a stainless steel serving line that offered batch-cooked food with the new Waterbury Café. This operation, a separate, branded, custom espresso bar/bakery, sits along one wall of the university's Alumni Dining Room. "When we eliminated the serving line, we were able to add 30 more seats to the dining room," D'Onofrio says. Food Deliveries, Storage and Preparation After food arrives at a loading dock, staff store it in a walk-in cooler, walk-in freezer and dry storage area that sits in a kitchen that once supported the old bulk prep operation. In addition to storage, staff now use this kitchen to prepare a few bulk items for the new cooking-on-demand program. They use two combi ovens, a 40-gallon tilt kettle and two energy-efficient fryers to prepare menu items such as chili, rice, potatoes, vegetables and soup. Staff bring these menu items to a 494-square-foot cooking-on-demand area and place them in refrigerators, and hot and cold wells, including sandwich prep refrigerators, for other staff to use when filling menu orders. The cooking-on-demand area also contains six rapid-cook ovens, as well as a toaster, fryer and ventless flattop griddle with a fire suppression system and air purifier. Staff use the equip- ment to prepare menu orders that appear on a video monitor. The menu items include rotisserie chicken, barbecue pork ribs, mac and cheese, jerk chicken, Bolognese lasagna rolls, burgers, chicken tenders and grilled chicken sandwiches. This menu is similar to the previous one, but staff now heat or cook each item to order to maintain freshness. "Orders are placed under a heat lamp for a few seconds before the staff takes them to the table," says Ben Markie, operations manager. 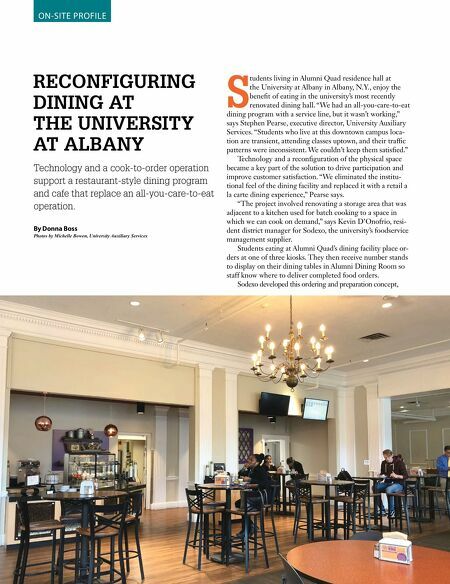 ● Opened: Kitchen at Alumni Quad opened in 2016; Food on Demand (FöD) and Waterbury Café, October 2017 ● Scope of Project: Renovation and reconfiguration of an unused space, which created a short-order prepara- tion and cooking area to support a new menu ordering system; renovation of a serving line area to create an espresso/bakery cafe ● Size: Food on Demand area, 494 sq. ft.; Waterbury Café, an espresso bar/bakery, 325 sq. ft. Not renovated, but part of the operation: the dining room, 4,950 sq. ft.; the kitchen, includ- ing refrigeration, storage and warewashing, 2,840 sq. ft. ● Seats: 175 ● Average Check: Prices for those without a meal plan at Alumni Dining Room are $8.50 for breakfast; $12.30 for lunch and dinner. One popular meal plan option, the myFlex meal plan, offers students living on Alumni Quad discounts in residence dining or retail dining when they are on another side of campus for classes. ● Total Annual Sales: $1.4 million ● Daily Transactions: 541 ● Hours: Monday through Thursday: 7:30 a.m. to 10 a.m., hot breakfast; 11 a.m. to 2:30 p.m., lunch; 5 p.m. to 8 p.m., dinner; 8 p.m. to 11 p.m., late dinner. Friday: 7:30 a.m. to 10 a.m., hot breakfast; 11 a.m. to 2:30 p.m., lunch; 5 p.m. to 9 p.m., dinner. Saturday: 11 a.m. to 4 p.m., brunch; 4 p.m. to 8 p.m., dinner. Sunday, 11 a.m. to 4 p.m., brunch; 4 p.m. to 8 p.m., dinner; 8 p.m. to 11 p.m., late dinner. ● Menu Specialties: Breakfast omelets, rotisserie chicken, barbecue pork ribs, jerk chicken, mac and cheese, Bolognese lasagna roll, burgers, chicken tenders, grilled chicken sandwiches ● Staff: 42 employees; 85 percent full-time and 15 percent part-time, including student workers ● Total Cost: $393,148 ● Equipment Investment: $216,021 ● Website: ualbanydining.com FACTS OF NOTE The Food on Demand kiosks greet customers as they enter Alumni Dining.